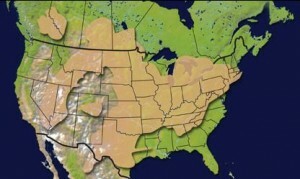 St. Peter Sandstone (shown as the tan deposit across North America) is just one among several examples of a continent-wide rock layer. One of the major themes in the story of the fossil record is the violent, large-scale catastrophes that created the great rock formations we observe today. Increasingly, geologists have been moving away from the gradualistic theories of Lyellian uniformitarianism and embracing “neo-catastrophism.” While they would emphasize the concept of localized catastrophes (often water-related), most would argue for many catastrophes forming the major features of the fossil record,with great ages elapsing between these formations. Creationists, on the other hand, feel that features like polystrate fossils (multiple layers intersected by a fossil), preserved delicate surface features (raindrops, tracks, ripples), lack of bioturbation (organisms like worms and roots disturbing the sediments), soft sediment deformation, and undisturbed bedding planes all point to continuous, rapid deposits. Basically, these features tie the great bulk of the rock record together into one large-scale event. Moreover, continent-wide deposits bear witness to a uniquely massive catastrophe alternating between deposition and erosion on a global scale. Moving current in a flume deposits multiple sediment layers simultaneously in the direction of the current flow. Fossil A would be deposited before B. While much work remains to be done in the area of creationist geology and paleontology, efforts like Joe Taylor’s analysis of fossil graveyards, the ICR’s observations of rapid stratification and canyon formation at Mt. 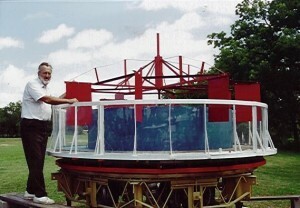 St. Helens, hydrodynamic experiments like those performed on Professor M.E. Clark’s flume apparatus (above left) and studies in stratification by the French Geologist Guy Berthault (see right) are adding exciting new empirical information to the debate. Steve Austin’s study of the Redwall Limestone in the Grand Canyon substantiated catastrophism with the discovery of billions of nautiloids, buried in a mass kill event covering many hundreds of square miles! Mike Oard’s model of wind and water gap formation has tremendous explanatory power. Increasingly the evidence calls into question traditional gradualistic interpretations of the geologic record and even secular geologists are turning back towards catastophism. 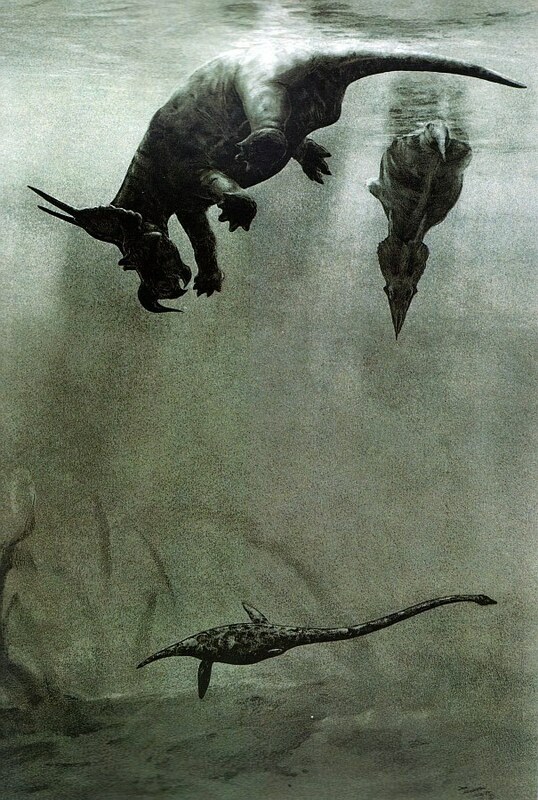 This leads us back to a biblical explanaiton for demise of the dinosaurs, a watery death at the time of the Genesis Flood. The great golden age of reptiles came to an abrupt halt when the earth was judged by God in the Noachian Deluge. Thereafter climactic conditions were such that the dragons were never able to get such a dominant foothold. Some adapted to the more harsh environment while others survived in remote equatorial regions. Hunted by men and threatened by ecological and environmental change, the great reptiles, as a group, were the ultimate victims of the great global catastrophe. In this regard, see our exhibits on What Killed the Dinosaurs? and The Dinosaur Death Pose.